In the past 3 years, media has gone through the biggest wave of changes in 20 years. In the early 90s, there was a “multi-media” boom, which was a turning point from the analog to the digital. Transition from TV and phones to computers and cellphones. Transitions from analog broadcasting networks and telephone networks to the digital broadcasting and the Internet. Below are the transitions since these changes. There are 3 new situations. Broadband networking has been made available nationwide in Japan. The digitization of broadcasting networks, which started argument in 1994, ended. The digital high-speed networks, that go across communication and broadcasting, have been completed. The construction of the information networks, which the government spent 100 years on, have been completed. Since 20 years before multi-media was advocated, the importance of the “contents” have been recognized. However, the content industry seems shrinking in Japan. Instead, social media is the focus, in terms of the amount of information and revenues. The leading role has been shifted from the contents to the communication and community. 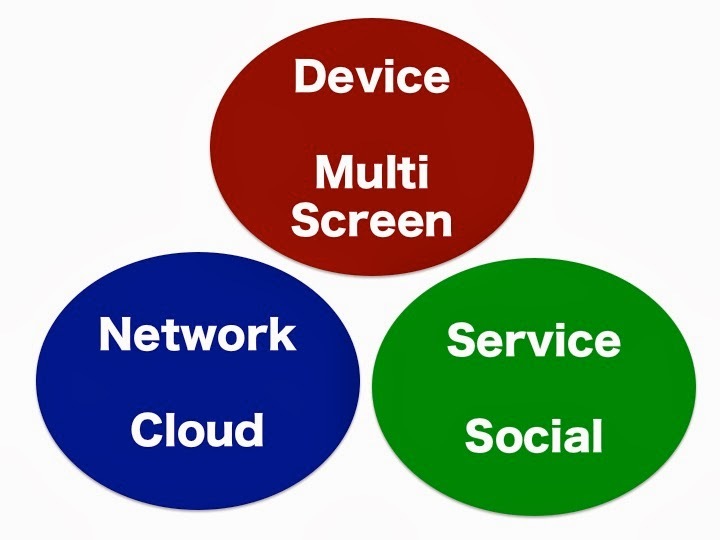 The three elements, 1) device, 2) network, and 3) service, which make up the media are all replaced. The multi-media in the early 90s was to create all-purpose all-in-one machines. However, today, the new media environment is completely the opposite. Multiple devices with disparate functions appeared again, and people use them simultaneously, connecting them through the networks. The important thing is that devices and networks are valuable for the “social media.” Until about 5 years ago, people feared that technologies behind the Internet, such as search engines, can control the society. However, as the technology improves, and digital multimedia was completed, the relationships between people became important after all. The “human powers,” such as friends, acquaintances, and reliant experts, have become the source of strengths. From machines and technologies to human. This is the consequence of the 20 years - a victory of the analog. Not bad. Digitalization has slowed down but I think now we will see the next phase finally.